Allspice features a vibrant and toasty scent which when mixed with other essential oils like Clove Bud, Sweet Orange, and Cinnamon, it resembles the feel of autumn. It has a unique fragrance that's why it can be used as a base scent for perfume, especially for men's cologne. Learn more about Allspice Essential Oil or find a great deal on the best selling Allspice Oil from the items below! 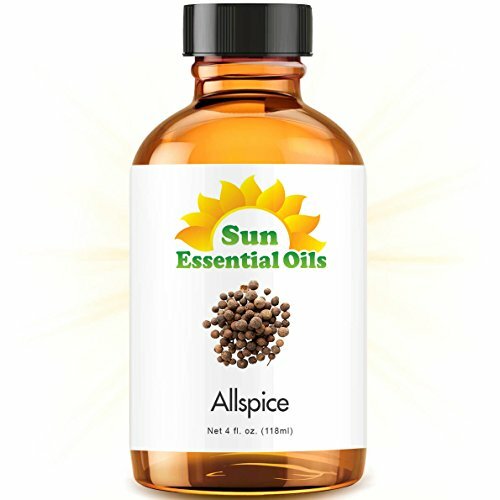 Allspice in a 4oz glass essential oil bottle. Comes with pipette for your convenience. Allspice Essential Oil. (Pimento Leaf) 10 ml. 100% Pure, Undiluted, Therapeutic Grade. Botanical Name: Pimenta officinalis Origin: India, Extraction Method: Steam Distilled, Plant Part: Berries, Strength of Aroma: Medium, Aromatic Scent: Allspice has a warm/sweet spicy scent. Blends well with: Cinnamon, Clove, Geranium, Ginger, Laurel Leaf, Lavender, Neroli, Orange, Patchouli, Pepper Black, Spearmint and Ylang Ylang. Suggested Uses: Allspice, also known as Pimento, is great for the digestive system. Add 1 drop Allspice and 2 drops Ginger to 1 tablespoon of carrier oil and apply to your abdomen. During cold and flu season, diffuse 1 drop each of Allspice and Cinnamon and 3 drops of Orange to help fight off a sickness. It is also a great oil for muscle aches and pains. Add 1 drop Allspice, Clove and Peppermint to 2 tablespoons of carrier oil and apply to affected areas. Cautions: We recommend a maximum dilution of 0.15% for topical applications. Allspice may inhibit blood clotting. Please Note: The International Federation of Aromatherapists does not recommend that Essential Oils be taken internally unless under the supervision of a Medical Doctor who is also qualified in clinical Aromatherapy. 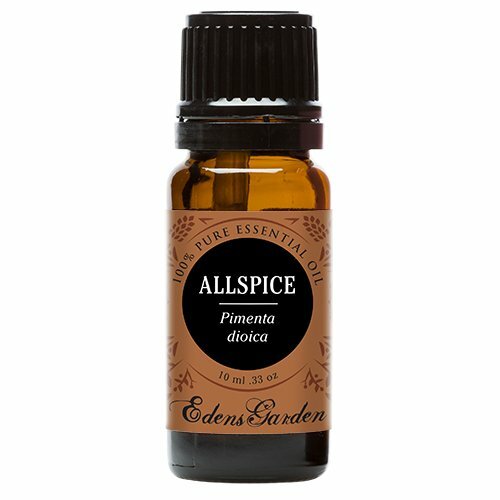 Silky Scents EO1-5ML 100 Percent Pure Therapeutic Grade Pimento Leaf Allspice Essential Oil - 5 ml. History: Pimento Leaf is also referred to as All-Spice. This is because of the combination of scents it demonstrates - cloves juniper berry cinnamon and pepper. Blends well with:Frankincense Ginger Lemon and Orange Sweet. Aromatic Description: It is spicy and warm like the spice. Features100% Pure Essential Oil Raw Material - Allspice Botanical Name - Pimenta Officinali Therapeutic Grade Capacity - 5 ml. 100% Pure Therapeutic Grade Allspice 10ml Essential Oil Botanical Name: Pimenta dioica Comes in 10ml amber glass essential oil bottle. European Dropper Cap included Allspice Essential Oil has a warm , masculine spice aroma with a sweet twinge. What sets Healing Solutions Essential Oils apart is superior cultivation of ingredients that are the best in the world. Combined with superior distillation and bottling care process, We GUARANTEE that our oils are aromatically superior and more effective than any other oils - if you disagree we will refund your money! The Leading Aromatherapy Associations (Alliance of International Aromatherapists (AIA), International Aromatherapy and Aromatic Medicine Association, Aromatherapy Trade Council, and others) all state that essential oils should not be taken internally (regardless of purity or organic origin) unless under the guidance of a health care practitioner trained at an appropriate level . As such, all of our oils carry a label warning that the product is NOT FOR INTERNAL USE. Botanical Name: Pimenta officinalis, Origin: India, Extraction Method: Steam Distilled, Plant Part: Berries, Strength of Aroma: Medium, Aromatic Scent: Allspice has a warm/sweet spicy scent. Blends well with: Cinnamon, Clove, Geranium, Ginger, Laurel Leaf, Lavender, Neroli, Orange, Patchouli, Pepper Black, Spearmint and Ylang Ylang. Suggested Uses: Allspice, also known as Pimento, is great for the digestive system. 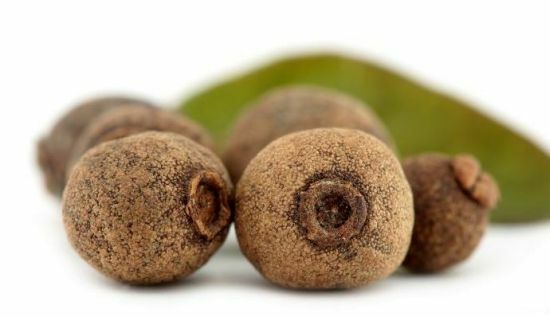 Add 1 drop Allspice and 2 drops Ginger to 1 tablespoon of carrier oil and apply to your abdomen. During cold and flu season, diffuse 1 drop each of Allspice and Cinnamon and 3 drops of Orange to help fight off a sickness. It is also a great oil for muscle aches and pains. Add 1 drop Allspice, Clove and Peppermint to 2 tablespoons of carrier oil and apply to affected areas. Cautions: We recommend a maximum dilution of 0.15% for topical applications. Allspice may inhibit blood clotting. Please Note: The International Federation of Aromatherapists does not recommend that Essential Oils be taken internally unless under the supervision of a Medical Doctor who is also qualified in clinical Aromatherapy.